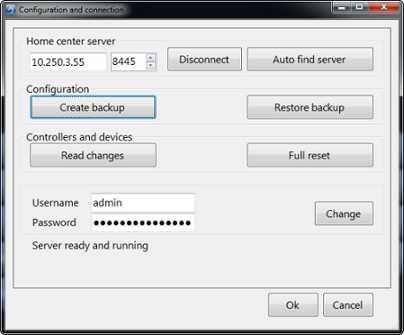 It is possible to save your configuration to a backup file. This is useful if you want to experiment a bit on the layouts of your zones. When it gets to messy you can restore your backup to get everything back as before. To do this hit the ‘Settings’ button, located on the far right of the bar on the bottom of your screen. Then select ‘Configuration’. In this screen there are two buttons ‘Create backup’ and ‘Restore backup’. Hitting the ‘Create backup’ will ask you where you want to locate the backup file. Press ‘Save’ to store the backup file. Do not change the content of this file! The file will be corrupt. ‘Restore backup’ will ask for the backup file and then restore it. the configuration from the Qbus controller.